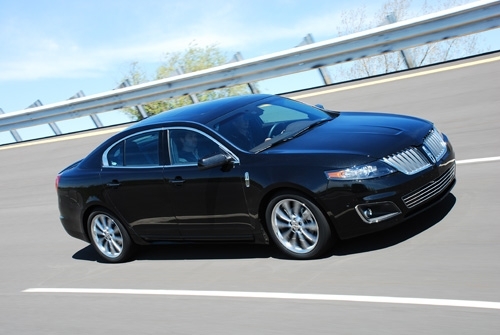 The 2010 Lincoln MKS will be Ford’s first model to receive its much-celebrated Ecoboost engine. The twin-turbocharged 3.5-liter V-6 produces an amazing 355 horsepower – beating out the Blue Oval’s 4.6-liter V-8 by 40 horses and still returning fuel economy in the mid-to-upper 20s. In the all-wheel drive MKS, the powerplant delivers effortless, quiet power for one of Lincoln’s most attractive models. Subtle acoustic changes to last year’s effort help to keep the car as quiet as can be, and Ford’s engineers have worked to tweak this full-size sedan’s suspension to give it handling to match the respectable power figures from its new engine. The result is an American luxury sedan that has what it takes to go ten rounds with the best Europe and Japan has to offer. The new twin-turbocharged Ecoboost engine is a marvel. The two small turbos spin quickly enough to negate any hint of turbo lag, and the maximum 350 lb-ft of torque is available from 1,500 rpm all the way up to 5,200 rpm, delivering easy passes without high-revving downshifts. 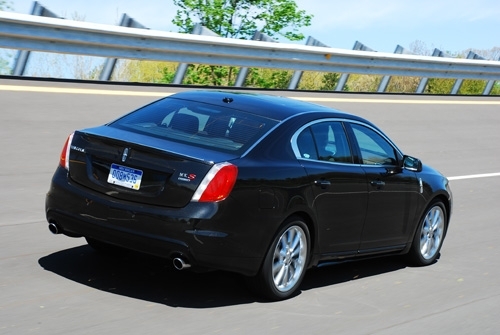 Fuel economy is similarly impressive from the 3.5-liter V-6; we saw up to 28 mpg during our time in the MKS. Despite Ford’s efforts to work the wallow out of the MKS’ suspension, the car continues to push in the corners and suffer from serious nose dive under hard braking. Given the car’s girth and comfortable ride, that’s somewhat acceptable, but not compared to its German competition. The most surprising aspect of the MKS Ecoboost’s drive is the quiet, consistent power. Though the twin-turbocharged 3.5-liter V-6 produces a handsome growl at higher rpm, the engine is remarkably quiet. The 355 horsepower on tap means getting hard onto the accelerator results in a pleasing push against your chest, and the six-speed automatic transmission is beautifully smooth. Ford has incorporated paddle shifters into the automatic, and unlike some models out there, these actually add to the overall driving experience instead of detracting from it. The cabin is comfortable thanks to well-bolstered leather seats and gobs of legroom, and visibility is excellent from the driver’s chair as well. The exciting news from Lincoln right now is Ford’s 3.5-liter, twin-turbocharged Ecoboost V-6 engine. It offers 355 horsepower and 350 lb-ft of torque, and in the MKS is coupled to a smooth-shifting six-speed automatic transmission and an all-wheel drive drivetrain. Lincoln is offering a unique sport appearance package for the 2009 MKS. The bits include blacked-out HID headlights, a new front lip, fog light pockets and a rear deck-lid spoiler. Unique 20-inch wheels are part of the package as well. Inside, a gorgeous Sienna brown leather interior with illuminated doorsills and embroidered floor mats join the exterior changes. Aside from the new-generation engine under the hood, the MKS Ecoboost can be had with SYNC – a clever, voice-activated media and phone organization system. Hands-free calling, navigation and a THX-certified 5.1 surround stereo all add to the tech goodies available on the MKS. The main advantage behind the new direct-injection, turbocharged engine from Ford is its fuel economy. The EPA hasn’t evaluated the MKS Ecoboost just yet, but Lincoln is hoping to see at least 17 mpg city and 24 mpg highway. Considering we saw up to 28 mpg highway during our time with the car, that shouldn’t be a problem. 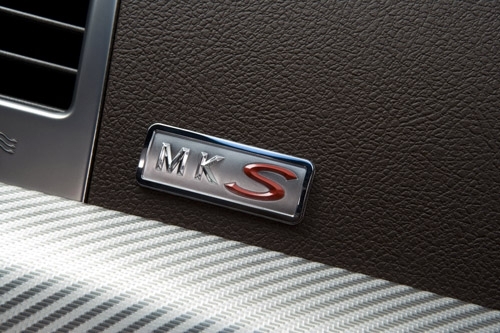 Lincoln has carried over the same high-quality materials we found in the 2009 MKS into the 2010. That means excellent leather seating, an attractive center stack and clever rear-window shade are all standard. The sport package’s Siena leather adds a certain level of flair, too. 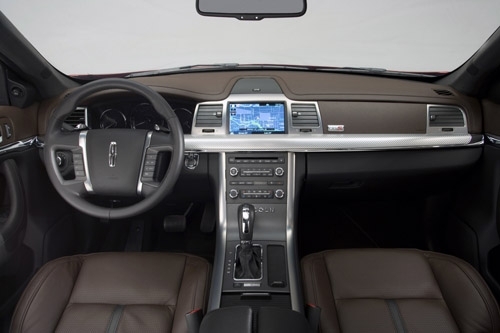 With Lincoln’s sharp waterfall grille up front, a sculpted hood and high shoulder line, the MKS is subtly styled. It may not grab your eye in a parking lot, but it’s attractive enough none the less. 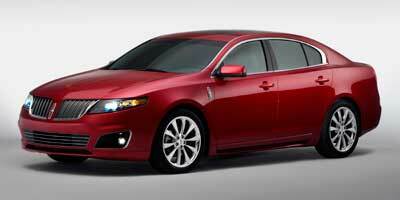 The 2010 Lincoln MKS Ecoboost is priced at $47,760, which puts it in the same category as the Lexus GS at $45,000, the BMW 528i at $45,800 and the Infiniti M at $45,800. It’s important to note few of the MKS’ competitors can offer the kind of power and fuel economy the Lincoln does, however. The 2010 MKS Ecoboost leaves very little to complain about. Power from the engine is abundant and ever ready, dodging the usual turbocharged ailments like lag, excessive noise and greater fuel consumption to deliver a great driving experience. The car’s fantastic fuel economy is an added benefit, though we have a hard time believing luxury buyers are overly concerned with the digits at the pump. Attractive inside and out, fuel efficient and powerful, it’s hard to go wrong with the MKS Ecoboost.